There are many Christmas customs that have nothing to do with the birth of Christ. What about the the most distinctive Christmas symbol of all, the “jolly old elf”? Some Christians have pointed out rather ominously that “Santa” has exactly the same letters as “Satan.” Santa, along with the associated gift giving frenzy, is a major distraction from the real meaning of Christmas. 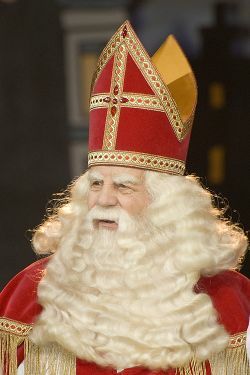 Yet the name “Santa Claus” is derived from the Dutch for “Saint Nicholas.” So what is the source of our idea of Santa? 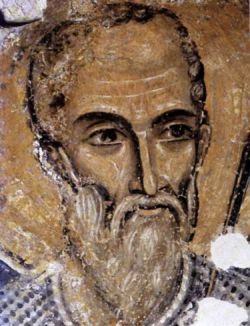 Saint Nicholas was a bishop who lived in the 4th century in Asia Minor, which is the area that is now modern day Turkey. We don’t know a lot about him, but some reports say that he attended the Council of Nicea in 325 AD. He died on Dec. 6, 346 AD (some sources say 343). According to the custom of the early church the date of his death, December 6, was established as Saint Nicholas Day. There are many stories and legends about Nicholas protecting and caring for the poor, including giving gifts to poor children and tossing coins into the windows of poor families. 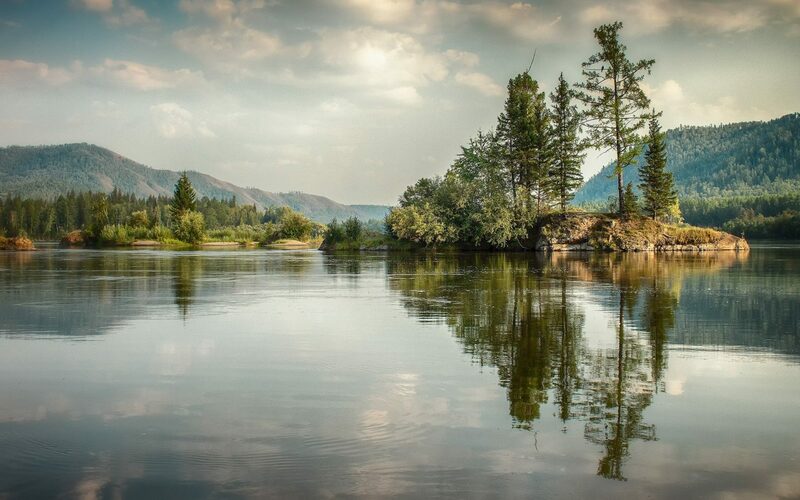 A famous story tells of how he tossed three small bags of gold into the window of the home of a poor family so that their three daughters would have the necessary dowry in order to be married. In Europe Saint Nicholas was know, among other things, as the benefactor of children. He was portrayed as a bearded man wearing bishop’s robes. Ideas about Saint Nicholas may have been influenced by beliefs about Odin, a major god of the Germanic people before Christianization. He was pictured in the 13th century as riding an eight legged horse that could leap great distances. Children would place their boots filled with carrots, straw and sugar near the chimney for Odin’s horse. Odin would reward these children by replacing these things with gifts or candy. This may have been the origin of the custom of hanging stockings by the fireplace for Santa to fill. In Europe children were given sweets and small gifts on Saint Nicholas Day, Dec. 6. In the Netherlands and Belgium Saint Nicholas was called “Sinterklaas.” He was depicted in a bishop’s robes and wearing a bishop’s hat. The connection with Saint Nicholas is much more obvious in the Christmas traditions of Europe than in the United States. 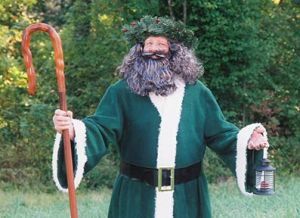 The British Father Christmas was described from the 17th century onwards as a bearded man wearing a long green fur-lined robe. Scrooge’s second visitor in Dicken’s A Christmas Carol is described as having a similar appearance. But now the red robe has become predominant due to the influence of the American Santa. European immigrants to the United States brought with them their Christmas customs. Dutch immigrants brought Sinterklaas with them, which was Americanized into “Santa Claus,” a name first used in the American press in 1773. Other influences made Santa into a peculiarly American tradition. 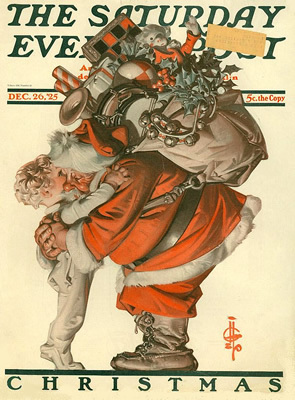 A famous Saturday Evening Post cover in 1925 came up with a drawing of Santa that is closer to the modern image, including the red suit. For 35 years beginning in 1931, Coca Cola used Santa in their ads. This helped to solidify the image of a rotund Santa in a red suit in the American consciousness. What shall we say about Santa Claus? Although there is a Christian influence in the historical origin of Santa, the concept has changed so much that it seems impossible to try to make Santa into a Christian symbol. Some have suggested that we celebrate the memory of Saint Nicholas on Dec. 6 and forget about Santa. While we might not celebrate saints’ days, at least we can learn something important from Saint Nicholas. This Christmas we could certainly do worse things than give gifts to the poor, especially poor children.